Joyce Magnin honors us with a guest blog this week. 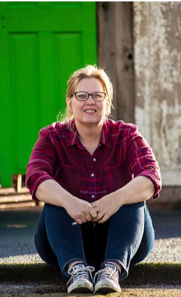 Joyce is the author of over a dozen books including the award-winning Bright’s Pond series, the Harriet Beamer books and five middle grade novels. I think you’ll fall in love with Joyce as I did. She’s a frequent conference speaker, mentor and editor. 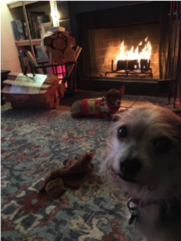 She lives in Vancouver, Washington with her dogs, Minnie and Scruffy. In her spare time she enjoys cross stitch, her grandsons and watching old movies. To top it off, Joyce is offering a giveaway. Check it out below. Here’s the thing, most people inherit money or jewelry or real estate. I inherited an onion. You see when my mother passed away all she really had left were the things in her nursing home room. Her life had been reduced to a few boxes of memorabilia–pictures, books, and the onion which was living in the glory of full sunshine on her windowsill. I inherited it all, including the onion. It’s really quite remarkable–the onion that is. After all, this particular onion plant was close to ninety years old when I became its mother. My mom got it from a neighbor friend shortly after she was married almost 70 years ago and the woman, who mom says was a strange old woman, gnarly and hag-like, said it was twenty years old at that time. The onion had been part of my life forever. Mom kept it in or near the kitchen. 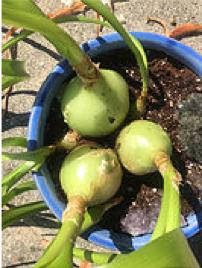 Sometimes it was seen in the bathroom, so it could get “some spritzing.” Mom called it the pregnant onion because every so often it would develop these fat bellies and little baby onions would pop out, fall into the soil and develop into larger onions like the ones in the picture. Mom would lovingly transplant the onions in fresh pots and give them away or keep them or sadly, sometimes they didn’t make it. So, from the original onion hundreds of children were born. The thing is, I am not the most gifted caretaker of things green and after a few weeks with me, I feared for the onion’s life. I gave it to my daughter Emily who has been caring for it these past many years and it’s thriving. Emily it seems, inherited my mother’s green thumb. My hope is that the onion will live on and one day Emily will pass it down. In a world where so much is disposable and temporary. Where life and circumstances can change in an instant, I am so glad that we had the onion, rock solid, thriving and now a beloved, living memory of my mother. But we all know the thing about onions and memories is that they can bring on the tears—sometimes when you’d rather not cry. 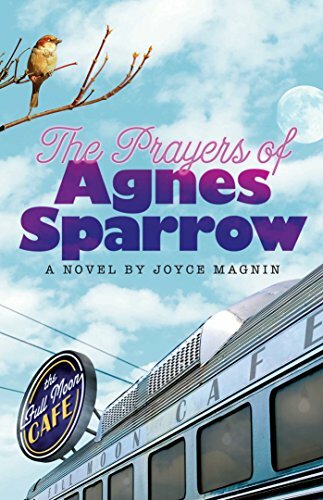 Mom lived long enough to see only one of my books published—The Prayers of Agnes Sparrow. But books, like the onion, tend to beget other books and from that first story dropped over a dozen more. They say writers are fortunate because we get to live twice—once, for real, and the other through the benefit of time and memory—the pillar upon which most novels rest. 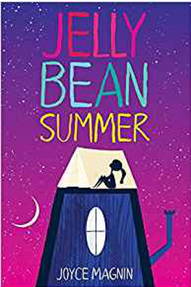 This includes my newest middle grade novel—Jelly Bean Summer. It’s mostly memoir—the true story of one of the darkest days of my life that, many years later, I found the nerve to write. Writing is like that sometimes—you have to dig deep and go places you’d sometimes rather not. But, out comes, I hope, a good book—a story that will touch lives and speak truth. Emily Dickinson said, “Tell the truth, but tell it slant.” The story is the “slant”. I love being a writer. I also love being an editor. God made me two ways—a writer and a teacher. Yay God! I love both. Writing is hard. It’s solitary. There’s no one standing behind you saying, “Atta girl.” Most likely all your mental illnesses are gathered around spewing not so encouraging words. Writing is so deeply personal, it makes us vulnerable to all manner of emotional beasties. Whatever your chosen category or genre, writing makes you vulnerable. It makes you question your very existence at times. It can be embarrassing, and it can be the most incredible journey you will ever take. If you have the chops! After publishing twelve novels and ghostwriting five or six others I think I can say I have the chops. Well I think I do. You see, even after all my publishing success I still approach each new project with the same trepidation, the same sense of impending failure and for the most part I completely forget how to write. Writing is hard. That’s why you should never go into that dark night of the soul alone. And that’s why I love to teach and to mentor. Writers need someone along for the ride who understands—most spouses do not. Most kids do not and besides you can’t always trust them to tell the truth or know what’s publishable. You can trust me. I have seen my students go on to publication. They’ve improved and gotten excited about their work. They’ve entered and won contests and grown in ways they weren’t expecting. I absolutely love it when a student succeeds. 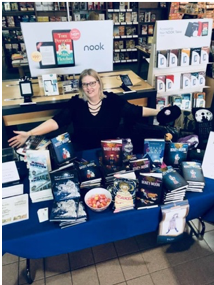 So, if you’re writing a book or a story and you think you could use a little guidance from a good teacher and a good writer (took me a long time to admit that) and a truly gentle soul then I might just be the mentor for you. I have openings right now I’d love to fill. So please get in touch. I like to think of myself as that onion, inspiring others, watching new baby books drop one after the other into the rich soil of marketing and blogging and bookstores. I always consider it an honor to have joined so many writers on their journey. Mom is, I’m sure, proud of me—for the writing—not so much for nearly killing her onion. Was I right or what? Joyce Magnin is just plain likable, someone you want to get to know. Find her books at https://amzn.to/2BxuzHg. To enter Joyce’s giveaway of Jelly Bean Summer or Blame it on the Mistletoe, just join our chat below. Lord, You take our breath away. First You give us life. Then You give us gifts. All before we’ve taken a single breath. As we look forward to this season of gift giving, we pause to reflect on the gifts of reading and writing. What joy You’ve wrapped into those gifts. Thank you. Bless us in our reading and writing. And give an extra measure of Your grace to Joyce Magnin as she writes, mentors, teaches, and edits with grace that can come only from You. Loved the story about the onion.Thanks for sharing! After our church’s Christmas program last night, I returned to this commenting having recalled, as I often do, family stories. My Grossmutter loved scallion onions and grew them in her garden in back of the home where she and Grandma lived. I have trail behind her, skipping happily to her gab, and was I ever shocked the first time she picked a scallion out of the rich, dark earth, shook it somewhat clean, and ate it that next moment, mmm-ing as she did. What a sweet memorial picture I am blessed to share with y’all!. My great grandmother was always a favorite. I will be writing hers and grandma’s stories soon for publication. Watch for “Grossmutter”, German for “grand mother”. What a sweet memory, Jane. Thanks. Joyce, thanks for offering to be a mentor for those of us who might be in need of that and may not even realize it yet. 🙂 I love your thoughts on your mom and the onion; I like your perspective that writer’s can “live twice” by writing about lives and life and then, being able to live their own. I had not thought of that but, it is so true! Thanks for writing and for sharing. Wow I loved hearing about the onion and I never would have thought of how writers would think until I read this. Thanks for sharing!! Hi, Rita! Great to have you in our chat group. I agree with you about the onion. How interesting … right? I hope you’ll join the circle again. My goodness, Joyce! You are a unique person. Where did you find her, Linda? Even your writing on Linda’s blog is wonderful, attention-getting, inspiring. Yes, I would like to speak with you about an editing relationship. Keep up the great work! I was reared on a farm and still missed out on pregnant onions. 🙂 Not only was Joyce’s post enjoyable, it was informative, too. Joyce, you are more than I can ever be! 🙂 Lately, I’ve gone through a time of too much on my slate and no “perfect” writing time. This chat with you is about the first thing…to do with writing…that I’ve accomplished in the last few months. I had given up the fight to find a time when I wasn’t too worn out to write. 🙁 But … I’m pulling myself out from under the weighted “to do” list and demands on my time. It’s almost like waking up from a bad dream and finding out my computer does still work! Ha. I understand, Karen. But Joyce encourages us, doesn’t she? Karen, I hear you, kiddo! I remember those days. But, here’s the thing–writers will write. Even if it’s just in your head. When I was a young Mom trying to write with two little kids underfoot it kind of went like this: Pour apple juice. Write for five minutes. Clean up the apple juice. Write for five minutes. If writing is really what you ant to do, please, keep trying. I loved Joyce long before this blog post – and I love her even more now. She’s an amazing author and wonderful friend. Thanks for hosting her! Love you, Joyce! You have been such an encouragement for me over the years! And you’re one of my favorite people to laugh with. Some, sweet day, I’ll get on a plane and come see you. Some sweet day. My sentiments about Joyce. Thanks for stopping by and encouraging us.